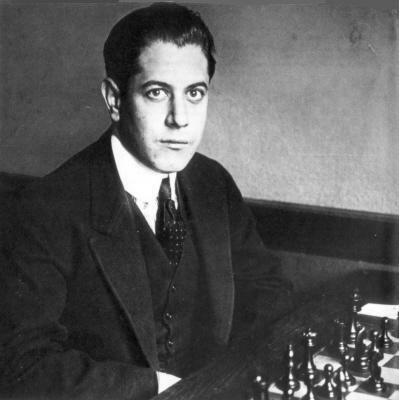 A number of Chess Notes items have discussed one of Capablanca’s most entertaining games, played against M. Fonaroff in New York, 1918. A digest of those items is presented here. 20 Nh6+ Kh8 21 Qxe5 Qxe5 22 Nxf7+ Resigns. A footnote in The Unknown Capablanca commented regarding the Institute: ‘This imposing title refers merely to a private school of music at 120 Claremont Avenue, NY.’ We would add that today this is the address of the Manhattan School of Music. ‘From the moment I first saw this game I fell in love with it!’, wrote Irving Chernev on page 445 of 1000 Best Short Games of Chess (New York, 1955). ‘An exquisite combination, this is one of my favourites’, he added on page 231 of Combinations The Heart of Chess (New York, 1960). ‘A magnificent game by Capablanca’, observed Roberto Grau on pages 355-356 of the December 1938 issue of El Ajedrez Americano (the longest annotations we have yet found). In fact, Alexander did not use the combination in that book, and ‘so well known’ is an accurate description. What is strange, though, is how, over time, the facts about the game have drifted away from what the New York Evening Post reported in June 1918.
page 19 of Der fertige Schach-Praktiker (Lepizig, 1923). The free-for-all marched on. ‘Fonarow’ on page 72 of Het Schaakphenomeen José Raoul Capablanca y Graupera by M. Euwe and L. Prins (The Hague, 1949). ‘Fonarov’ on page 40 of The Chess-Player’s Week-End Book by R.N. Coles (London, 1950). ‘Taneroff’, wrote Bruce Hayden on page 366 of the December 1958 Chess Review, with the date of the game given as 1910; the feature was subsequently reprinted on pages 187-189 of Hayden’s book Cabbage Heads and Chess Kings (London, 1960) with the same errors. The game also turned up again on page 361 of Chess Review, December 1960, courtesy of Jack Straley Battell (who was a Tanerowian and a 1910-ite). ‘Tannarov’ was to be found in the monograph on Capablanca by S. Petrović (Zagreb, 1974). Confusion also grew over the correct date, with 1918 frequently elbowed aside by ‘1904’ as well as ‘1910’. Page 373 of Kings, Commoners and Knaves offered an example of how a chess writer (another lenient term here) declined to budge from his ‘1904’ even after he had been corrected. Nonetheless, the wrong dates are not recent inventions. For instance, although ‘1904’ was given on page 26 of Encyclopaedia of Chess Middlegames (Belgrade, 1980), a book published in Kecskemét in 1943 (Capablanca Sakkozói pályafutása és játszmái 1888-1942 by F. Chalupetzky and L. Tóth) had appended no date or venue to Capablanca v Fonaroff but had placed it in the juvenilia section (on page 22). Reinfeld’s The Immortal Games of Capablanca (which had Black’s name as ‘Tanerow’) stated that the occasion was ‘New York, 1910?’. (The question mark was injudiciously removed from the 1974 edition.) The first Capablanca monograph to include the game was Glorias del Tablero “Capablanca” by José A. Gelabert (Havana, 1923). Although it proposed no date (see page 125), the order of games implied circa 1910. It need hardly be added that Capablanca published the game in none of his own books. 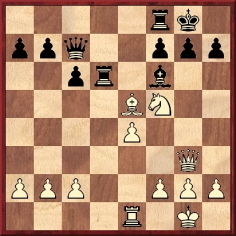 Then there is the discrepancy over the opening moves. Réti presented the game on pages 67-69 of his 1922 book Die Neuen Ideen im Schachspiel. (It had no heading apart from ‘Capablanca-Amateur’, although for most other games Réti furnished details of the venue and date. These were mysteriously omitted from the English translation, Modern Ideas in Chess.) 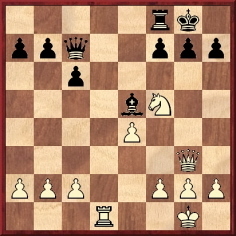 Réti gave the opening moves not as 1 e4 e5 2 Nf3 Nc6 3 d4 d6 4 Nc3 Nf6 5 Bb5 Bd7 but as the more ‘natural’1 e4 e5 2 Nf3 Nc6 3 Bb5 Nf6 4 O-O d6 5 d4 Bd7. Reinfeld did the same in his book on Capablanca and commented thus on the alleged move 4…d6: ‘Black’s order of moves is a well-known finesse to avoid White’s queen-side castling, which often leads to a dangerous attack difficult for Black to parry.’ On this The Unknown Capablanca commented dryly, ‘…one annotator refers to “Black’s well-known finesse” in a position which did not, in fact, occur’. Unfortunately, this clever line does not work, because of 22…Bxf2+ 23 Kxf2 Qb6+. No detailed analysis of that critical point has yet been found, but the game continues to stimulate chess authors’ sense of fantasy. While finalizing this item, we happened to see that page 65 of Chess Training Pocket Book by Lev Alburt (New York, 2000) names Capablanca’s opponent as ‘Foxcroft’. An obituary published in Musical America of 10 January 1930 reported that he was born in Russia and went to the United States as a youth. He taught the violin in New York City from 1903 until his retirement in 1927, and he died in New York City on 19 December 1929. His wife, Vera Fonaroff, was also a violinist and teacher, at the Curtis Institute of Music in Philadelphia. The couple had two daughters, Olga and Nina. Other records indicate that ‘Mark M. Fonaroff’ taught the violin at the Institute of Musical Art, Juilliard’s predecessor institution, from the 1906-07 academic year until the 1929-30 academic year. However, according to the unpublished appendix to Frank Damrosch’s book Institute of Musical Art, 1905-1926 (Juilliard School of Music, New York, 1936), Fonaroff did not teach after falling ill in 1928. This is the only time we recall seeing the ‘beautiful, but unfortunate’ remark attributed to Pollock. As noted on page 258 of Chess Explorations, we have traced it back, in relation to Janowsky, to 1898, i.e. two years after Pollock’s death. We now note that on page 68 of the December 1918 Chess Amateur 18…Qa5 was described as ‘the right move … pointed out to us by Mr Gosset’. The magazine also gave the 19 f4 Bxe5 20 fxe5 Qc5+ line indicated by a correspondent in C.N. 2537. Addition on 24 December 2010: On page 102 of Die Hypermoderne Schachpartie by S. Tartakower (Vienna, 1924) the game was given as won by Capablanca against Tanarow in a New York tournament. Yet another version of Black’s name can be added: Fornaroff. It appears on pages 167 and 211 of Vademecum de ajedrez by Julio Ganzo (Madrid, 1972). The uncertainty over the occasion of the game and Black’s identity was mentioned, with the spellings Fonarow and Tanarow, in D.J. Morgan’s Quotes and Queries column (item 2069) in the March 1970 BCM, page 78. A subsequent item (2099, on page 175 of the June 1970 BCM) stated: ‘Sir Richard Clarke tells us that Capablanca’s opponent in that simultaneous game (No. 2069, March) was Professor Aire Foncroff of the New York Institute of Musical Art.’ No explanation for this erroneous information is available. José Raúl Capablanca A Chess Biography by M.A. Sánchez (Jefferson, 2015) gave the Capablanca v Fonaroff game on page 132. Although it was correctly dated 18 June 1918, it appeared in the section dealing with the year 1910. Latest update: 23 April 2017.